From Detroit, Niecie is bringing Blues that heat up teh room with the power of soul. 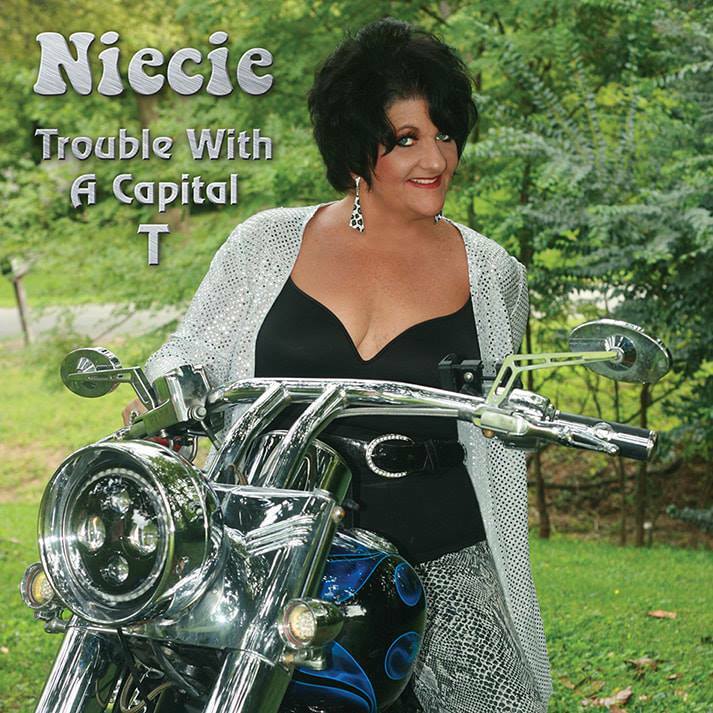 Niecie, latest album Trouble With A Capital T was released on Ride The Tiger Records, 12th November 2018. The album is Produced by Grammy Lifetime Achievement Award winner former Allman Brothers Johnny Neel. Bluesdoodles Review coming soon! LG: I understand that Trouble with a Capital T was not your first choice for this CD? What was it originally and why did you change your mind? Niecie: The CD was slated to be entitled “Sweat”. Once we listened down to the final tracks we decided that “Trouble With A Capital T” was better suited for the title track. It is more upbeat and had a funky dance groove. The title itself gave more room to play with and on the radio. LG: Please explain your songwriting process. Do you start with a hook, a melody or lyrics or a combination? Niecie: Tunes come in many ways, shapes and forms. Sometimes an idea is triggered and it goes from there. There are times that as hook gets stuck in my head and build around it from there. A groove will pop in my head other times and I write lyrics around that. I have written in formal writing sessions in Nashville, driving in my car, sitting around a campfire….where ever it hits me. Niecie: I have been gigging since I was 16. I started out as more of a rocker at first. As far as, the blues, it all started in Lincoln, Nebraska. I was playing a club on the campus area of the university with a rock band I was touring with out of Boston. I was out on a break and Magic Slim who was playing the Zoo Bar approached me and told me he heard me from outside the club I was playing and said: “Girl you need to sing the blues”. Slim invited me up on stage with him. I talked my band into playing few instrumentals and beelined on stage with Magic Slim. The rest is history. LG: I like the way you mixed it up on the CD, for instance Memphis Stomp is funky. How do you go about deciding how to mix different styles of the blues? You have a little of everything in this CD. Niecie: Usually I tend more towards rock blues. We decided on this CD to give a taste of my other styles and influences. So as a result, we just let the creativity flow and what came out is what came out. LG: Who were your influences? LG: Who are some of the most interesting artists you have performed with? Niecie: Larry McCray, Magic Slim, Koko Taylor, Shaun Murphy, Anthony Gomes but most of all my producer Grammy Lifetime Achievement award winner former Allman Brothers Johnny Neel. He is a creative monster. When you are on stage with him you never know where it will go and I love that challenge. LG: You are 12 years old in your bedroom singing into your hairbrush, who are you? LG: What would people be most surprised to learn about you? Niecie: Back in the day I was a professional dancer for about 20 years in Jazz and Ballet. I also was an eye model around that same time for a French cosmetic firm which is how I got over to Europe to tour musically. At that time, though I was doing rock and had not yet acquired my stagename Niecie. I gig wherever I am at, so when I was there for lengths of time, I was fortunate enough to book gigs around Europe. LG: I understand you had the rare opportunity to go to Paisley Park? Will you explain how that came to be and what that experience was like? Niecie: My old guitar player from Detroit has a brother that played keys for Prince back in the 90’s. I had a gig in Minneapolis, so I rubbed elbows with this keyboard player and he got me an invite to an exclusive performance. The experience was life-changing. Being so close to Prince that I could count his eyelashes left me speechless. LG: What age were you when that first song tickled your ear and you knew you wanted to be a singer? Niecie: I was 8 years old.